Kyith: This is an update of an article I have written in 2016 Jul. I added a few examples, try to make some of the things clearer, and correct some grammar mistakes. This is a short philosophical piece that I hope will help some of you with some advance wealth building concepts. My friends La Pap and B both talked about building their investment portfolio and they are very focused on talking about how large they want the portfolio to grow to. In B’s case, he has an awakening that valuation is unsustainable right now (Jul 2016) in terms of things yielding 5% and thus it is better to sell now, keep the capital intact, so that he can redeploy later. He is a shrewd one, but also a nimble one, who have a good philosophical high level understanding on investing and is able to execute successfully time and time again. If you would like to learn how to do that well with stocks consistently do follow his blog. What La Pap and B is philosophically planning is trying to find a fundamentally sound way of visualizing what is the future sustainable potential of their wealth machine(s) (what is a wealth machine). The thread that is pulling them along is the future eventual value of their wealth machine(s). And to provide that usage, your wealth machine(s) need to provide something. Often it is in the form of cash flow. However, what we observe is that wealth builders are attracted to financial assets that provides a cash distribution during their wealth accumulation phase. This can be insurance endowment that distributes a cash flow, high dividend yielding stocks, buy and rent investment properties. If you are in the wealth accumulation stage, you do not need to have a financial assets that distributes a lot of cash flow. When you get these cash flows, you will still need to find ideas to reinvest these cash flows. This can be a problem for some. For example, a lot of us are thinking: right now my wealth machine(s) value is $150,000. It is currently paying me $7,800 in dividends last year. My yield on value is $7,800/$150,000 = 5.2%. Another example: If we purchase this private condo, once we pay it off, it can give us a rental of $3,300/mth. The problem with a big focus on yield is that the dividend yield, or rental yield is not the only return. There is the capital appreciation or the growth component. Having too much emphasis disrupts the evaluation of the growth component. May yield investors even treat the capital appreciation as a good to have. How can we shift the focus? Some of my close friends who are investors look at things this way. And I do use this method as well. We call this the Wealth Machine(s)’ Yield Potential. We don’t look at how much yield the portfolio or wealth machine(s) is giving us now. We anticipate and visualize the scenario where we sell off all our current wealth machine(s) and purchase wealth machine(s) that specialized in providing yield. For example, suppose my investment portfolio is $635,000 and currently provides me with a dividend yield of $15,500. The yield on portfolio value is $15,500 / $635,000 = 2.4%. 2.4% is not the yield we envision when the machine reach our eventual goal. These 5 stocks currently (Oct 2017) provides conservative dividend yield of 4.7% to 5.8% based on their business model. WE can imagine that we shift our wealth machine(s) eventually into them if we need to. This provides us with a conservative estimation of the dividend yield we can achieve. Of course, if your needs are higher, or you prefer to take on more risk, you can select a portfolio that provides a higher dividend yield. In this case, the yield potential of my current value of $635,000 is $635,000 x 0.047 = $29,845/yr. 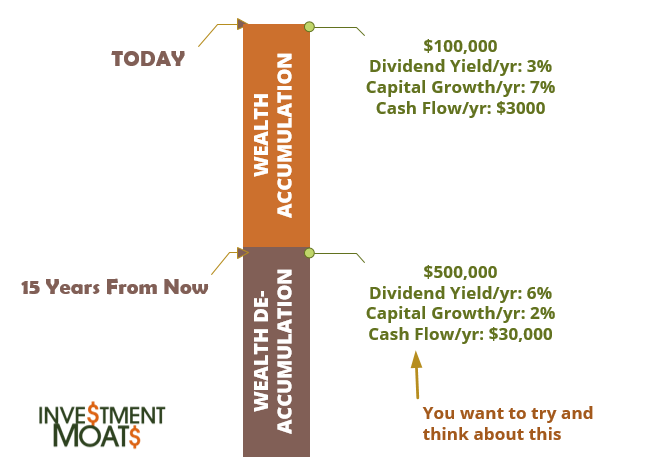 As a person person accumulating wealth, your wealth machine(s) of $100,000 can be positioned by finding assets that have a 7% capital growth with a lower dividend yield. You could even have all capital growth and no dividend yield. As you add capital to it, perhaps in 15 years, it grows to $300,000 then $500,000. Along the way you could have that conversation with yourself: At $355,000, I could sell off these and put them in a 6% yielding wealth machine, that can give me $355,000 x 0.06 = $21,300/yr. This is entirely believable, because along the way in your wealth building, you gain the competency and have identified conservative companies, businesses or financial assets that could yield a minimum of 5-6%/yr. Net worth does not mean much if you cannot re-deploy it. Looking upon it this way provides an understanding of the utility of your net worth. Every time you look at your personal net worth statement, you can mentally multiply by 3%, 4%, 5% or 6%, to see your wealth machine(s) current yield potential. Related: Learn how to easily track your net worth, and use this yield potential mind hack today. You might already reach a financially secured stage of life and you might have the option to transition from a wealth accumulating portfolio to one that provides more distribution and more wealth preservation. Do you need cash flow now? How sturdy is your job, that your wealth machine(s) need to provide cash flow? Related: Find out how much you need for financial independence or financial security. Being an advocate of dividend investing, I am afraid sometimes I send the wrong message that we should be focused on dividends. I cannot control your brain, and you might be overly focus on generating dividends in the near term for your wealth machine. You have to understand that returns in stocks are made up of dividend yield you earned in a year and the average capital growth held for the period. Some stocks such as Sheng Siong have a low 4% dividend yield but people expect their dividend capital growth to average out higher than 3%, perhaps 5% per year. You have your large real estate investment trust Ascendas REIT (Dividend Yield 6.3%/yr) with a lower expected growth of 2% based on inflation per year. This is provided your wealth assets are liquid. Based on your wealth plan, you can optimize your current value of your portfolio, to financial assets / stocks/ bonds/ ETF that fits your future wealth objective better. Change from wealth accumulation to wealth preservation. As your money reaches a certain size, and as your human capital depletes, you realize you cannot afford to have a massive capital loss, since you cannot earn it back. Your “emotional stop loss” becomes bigger as you grow less tolerant to market draw downs. Shifting from an active stock/bond portfolio to a more passive exchange traded fund (ETF) portfolio. As you climbed the corporate ladder and family grows more matured, you realize that you cannot find the time to pick individual stocks any more. You could always shift your approach by selling your portfolio and moving them to a passive ETF portfolio. The dynamics of management, time commitment is different between the 2, and while you have less control over the returns and volatility, you are able to build wealth in a fundamentally sound manner. Shifting from Investment Assets/Bonds to Annuity. This example is something that we can identified with. We accumulate our money in our CPF at a rate of 2.5%-6% in investment assets provided by the government. Upon reaching the age of 65 years old, our wealth assets in the CPF is converted to CPF Life, which is an example of a single premium immediate annuity (SPIA). Shifting from a 100% equity stock portfolio to a bond ladder. You choose to build your wealth by allocating 100% into equity/stock based unit trust or exchange traded funds. You have amassed a large amount of wealth. As you grow older you shift your money from the equity stock portfolio by selling them away and forming a 10 year bond ladder with a mixture of corporate bonds and government bonds. You earn an average of 2% prevailing yield, which is adequate given the size of your wealth asset. In this way whether the interest rate increases or fall, the bond ladder ensures there is always bonds maturing which you can downshift or up shift to a bond of different interest rate. The challenge is always to not fall for the sunk cost fallacy. A sunk cost is a cost that is being paid in the past and can never recovered back. In investing, if we have some stocks that are in the red, and we realize we made a mistake, we tend not to be able to sell it off and shift to another stock because we fall for the sunk cost fallacy. Let me know if you have made a decision in the past, or in the future to shift from one mix of wealth assets to another. Thanks for the mention Kyith. You are spot on. What our mind is thinking is to grow the base to a comfortable level high enough that the yield for cashflow would be sufficient enough to sustain our lifestyle and that growing of base can take in many forms. This has been a constant weigh on my mind everytime im choosing to take between a reit and a developer, especially in recent years with reits giving the edge over not only with the dividend but also growth edging over developers. I guess your post is probably trying to get younger investors to think about total returns instead of just the dividend returns/cashflow which they do not require right now. I largely agree with you but let me be the devil’s advocate here. Perhaps it would be hard to transition to a yield-heavy portfolio if one has no experience of doing it? I might advocate a slow transition model. Maybe with every decade, aim to increase yield by 0.5%? Would be interesting to hear your thoughts on this. hi My 15HWW, thanks for the reply. I think if one is managing an active portfolio, then they would be equipped to evaluate the profile of another set of businesses that have a different characteristics. If your aim is to eventually scale up to a $X cash flow and do not want to do the work at one go, which can be quite stress full then you can raise it along the way. It depends on how competent you are, your goal and all. the other part of the equation is not falling for the sunk cost problem and evaluate based on current value, thinking how well they do going forward. How about applying the concept of compounding by re-investing back the dividends into the dividend stock? hi Cozzybay, compounding works on dividend stocks. In fact, it is better you reinvest your dividend back into stocks. but you have to know what is the future expected return of the stock you invest in. When you reinvest, you put the management of your money in someone else, in this case it is the ceo of the stock you purchase. typically the returns in the future is the return on equity, or return on invested capital. typically a high dividend stock might be matured or low growth, so you have to be aware of that.